This is the 40th year of the kayak club in UL and to Commemorate we will be having a weekend of celebrations next semester.Our 40th Anniversary celebrations are taking place on the weekend of April 9th-10th 2016. We would love for as many former members, young and old, to attend no matter where you are in the world. And please SPREAD THE WORD! This is a massive milestone for any club and we want to have an event to match the achievement. Take a look at the video below. Hopefully it resurrects some good memories. Here’s a write up by one of our members Josh Morris about this years club trip to Wicklow. It was a cold, dark evening but spirits were high when we arrived onto the boathouse at 6 o’clock for our weekend long trip to Wicklow! Everything started off well, we were all fairly quick to start packing our gear and making sure we had everything ready for the trip. However it wasn’t long before someone decided to start playing some tunes through the speakers. That’s kind of where it went downhill. All work was ceased and everyone decided to have a bit of a dance off instead. Sure it delayed our set off time but it was well worth the craic! We finished packing the sprinter and all the other cars heading up. There wasn’t a space left unused. We just about managed to load ourselves into the cars and off we went. 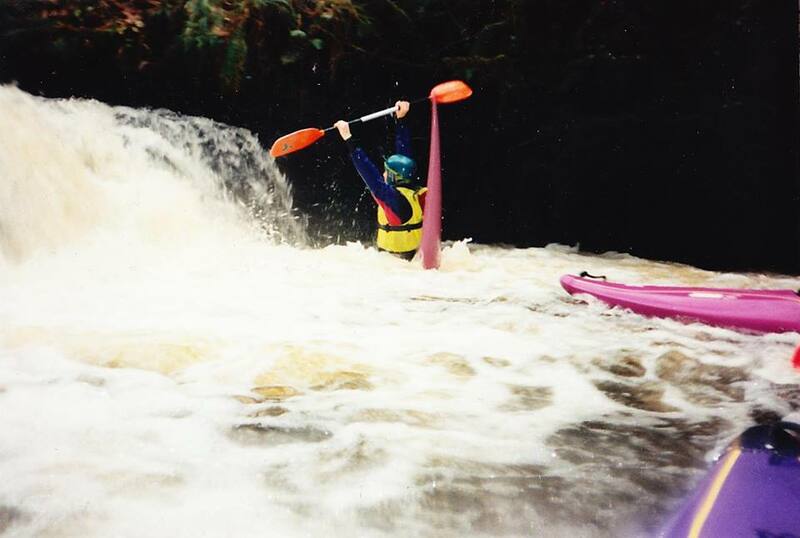 Everyone was fairly excited as this was the first kayaking trip to Wicklow for most going and the first time on a river for a few! The journey was going well, time was flying by! That is until we reached the Wicklow gap, the fog was so dense that we had to reduce our speed to a literal snail’s pace. We shuffled our way ahead and eventually reached the hostel at about 10. A quick game of Room Roulette later and we all had our rooms for the weekend. We claimed our own bit of space to sleep for the weekend, not that there was much of that. After having a bit of craic in the hostel and playing a few “get to know each other” games we decided to head on down to the local bar for a few quite ones. There was a great buzz around the place but we ended up pretty much taking over due to our sheer number of people. We stayed for there for a while and eventually most decided to head off back to bed. Needless to say there were shenanigans taking place on the short walk back up the road and some Dora’s got lost in the woods on some magical adventure to find an old round monastery tower. We found out, it wasn’t that spectacular especially in the dark. Don’t be fooled! We were woken at the ungodly time of 7 AM, the next morning, which was a major shock to the system considering I had only ever heard of such a time existing in legends of old. The hostel became the new setting for one of the scenes from “The Walking Dead”. We got ourselves a bit of breakfast, shuffled on out to the cars and took our short 20 minute drive to the get on of the river. We had decided to run the Annamoe river section. We began to get changed and were on the river in no time! We weren’t… it was 11:30, why did we even get up at 7? We did the usual stuff of playing some warm up games, which were great fun, and sorting our groups for on the river but most importantly we distributed those all-important (and delicious) river snacks. 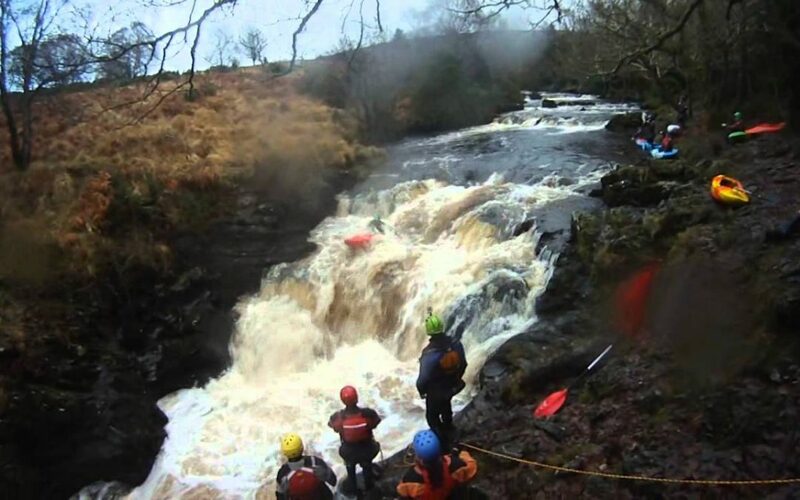 We had a great run of the river, doing notable features such as the Guinness Rapids. Boulder Garden and the lead up to Jacksons. The level of standards on the river was outstanding. Everyone did extremely well including all our beginners. 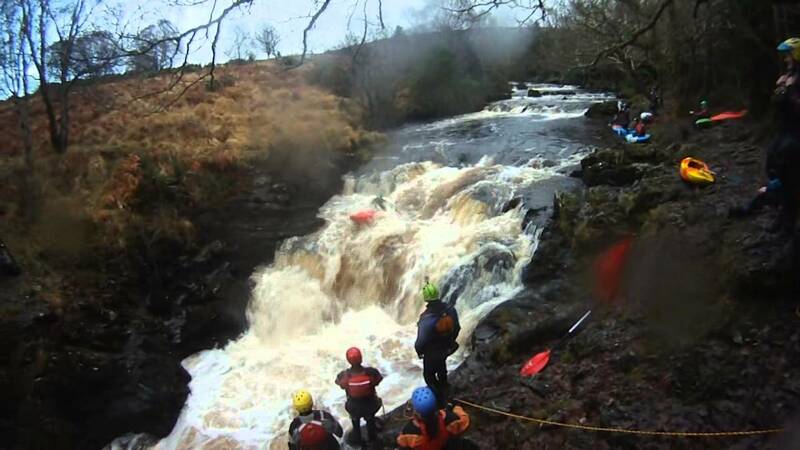 After the lead up to Jacksons we all got out of our boats to see what lay before use, the wonderful Jackson Falls. Solid Grade 4 water so I hear. I had seen some videos of this but none compared to how it looked from the top of the 30 foot cliff face. Only the more advanced paddlers were being allowed to run this particular rapid due to its technicality and difficulty. All our beginners got out to watch the carnage, all except one. One fresher, known only as Donegal Mark, was so determined to run it we had to let him try. I think it would be an understatement to say that he performed outstandingly! As it were Halloween night some of us decided it would be a waste to get out of our gear straight after the river so we decided to go trick or treating instead! We were rewarded bountifully! It was certainly worth the effort and all the people questioning us on being twelve year olds. We got out of our gear, packed up and headed straight back to the hostel. Everyone was shattered, people were dropping all over the place for a nap here and there all the while a few were busy down stairs preparing that evenings dinner. We awoke refreshed (somewhat) got our dinner and headed straight on down to the bar once more with a special agenda in mind; celebrations for not one but TWO birthdays. Needless to say the craic was has. Celebratory singing and chanting plenty abound. Not to mention the odd twenty or so kisses. A great night was had by all. The next morning there was a little bit of a logistical issue what with someone’s alarm “accidentally” not going off. So we all got a decent lie in. Woop! It wasn’t all fun and games unfortunately. We were kind of in a rush to pack up clean and leave due to our little alarm mishap. It was all go go go from getting up. A quick breakfast, a small tidy and we were once again ready to hit the road for our last river of the trip. We headed up further than the day before to the Loughdan get on. We were running the river section above the section we did previous. All things considered it was another good day on the river despite everyone being exhausted from the weekend. There was that one incident with some horses but we won’t dwell on that! We finished the river for about 4 that afternoon, began packing up all our gear and we were ready to hit the road soon after. We began our long journey home through the dense Wicklow fog and winding back roads. Making progress was difficult enough but it was managed well enough. We all decided that we’d meet up at Junction 14 for some food, after all you could physically see everyone falling away after such a long day on the river. We pulled in, parked up and pretty much took over the shop due to our substantial numbers. The line for Supermacs was practically to the door! I can tell you one thing for sure, the number of 7 and a half ounce burgers that were consumed on that day was roughly equal to the meat from three cows! After visiting Spar and buying more snacks for the remainder of the trip we set off once more! The drive went by quick and we ended up back in Limerick in good time. Back at the boathouse we once again set about putting back all our gear from the weekend, which is a lot. This process was once more helped along by some great music provided by our resident DJs. That was it. Another year and another successful club trip! Just a quick thanks for all who came along to make it what it was! Hope you all enjoyed the weekend! For those who missed out, there’s always next time!